Louis R. Bruce was born on the St. Regis Indian Reservation in New York on January 16, 1877, the son of a Mohawk Indian chief. As a boy, Bruce came to Philadelphia to live and study at the Lincoln Institute, a residential school for Indians, located at 324 S. 11th Street. He attended Philadelphia’s Central High School where he excelled as a student and as an athlete before graduating with an A.B. degree in 1899. His family was living on Cornwall Island, Ontario, Canada, when Bruce began attending the University of Pennsylvania Dental School in the fall of 1901. 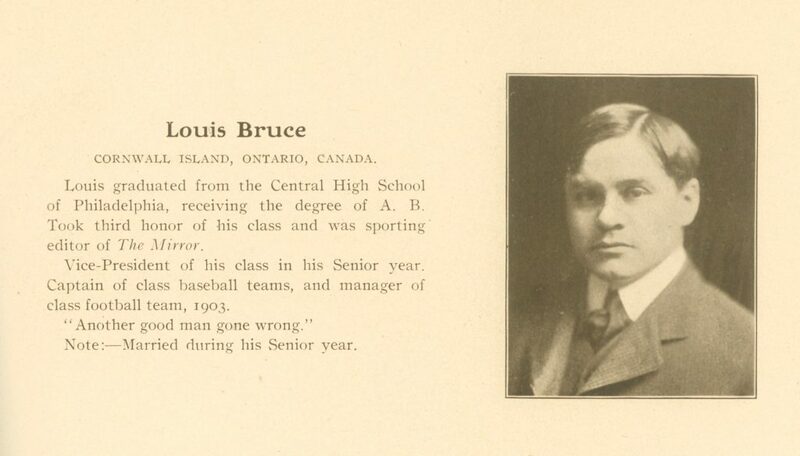 Bruce was captain of his class’s baseball teams as well as manager of his class’ 1903 football team, and vice president of his senior class. During his last year of dental school, Bruce married Noresta Rooks, the daughter of a Sioux chieftain who had also lived most of her life at the Lincoln Institute in Philadelphia. Their marriage took place at St. Luke’s Episcopal Church in Philadelphia, located not far from the Lincoln Institute. Bruce began playing professional baseball with minor league teams in Toronto, Indianapolis, Columbus, and Rutland, Vermont. He made his major league debut with the Philadelphia Athletics on June 22, 1904 — about the time he completed dental school. After completing this season with the Athletics, Bruce did not play any more major league ball. Bruce later moved to Syracuse to study at Syracuse University’s School of Theology. In 1910 Bruce established a dental practice in Syracuse at the same time he began his ministry at the Nedrow Reservation in Onondaga County, New York. In 1917 he returned to serve the St. Regis Indian Mission, but would preach from a number of other pulpits as well before his retirement from the Methodist ministry in 1949. Bruce was also the organizer of the National Congress of American Indians and an active proponent of the American Citizenship Bill which was passed in 1924 to grant Indian suffrage. Bruce died on February 9, 1968, at the home of his daughter in Ilion, New York. Shortly thereafter his son, Louis R. Bruce, Jr., became the United States Commissioner of Indian Affairs, serving in this position from 1969 until 1973.